Brooke Bond was the largest tea company in the world. Its PG Tips product is the highest selling tea in the UK. Arthur Brooke (1845 – 1918), was the son of a tea dealer from Ashton under Lyne, Lancashire. He trained at the wholesale tea firm of Peek Brothers & Winch in Liverpool, and later London. Brooke opened a shop in Manchester selling tea, coffee and sugar in 1869. He traded as “Brooke, Bond & Co”. Brooke simply liked the sound of the name, and a Mr Bond was never associated with the business. At a time when groceries were largely sold on credit, Brooke took cash payments only. Within three years he had opened shops in Liverpool, Leeds and Bradford. Brooke relocated to London and opened a blending warehouse on Whitechapel High Street in 1872. He controlled his own distribution in order to ensure freshness. A tea trade depression saw Brooke sell his London and Scottish stores in the 1870s, and convinced him to pursue the wholesale business. Brooke was a model employer, who pioneered the eight hour working day, and paid higher wages than his competitors. Brooke was also an early adopter of profit-sharing. First introduced for his 154 employees in 1882, the scheme accounted for an average of a ten percent staff bonus every year by 1891. Brooke Bond was converted into a limited liability company with a share capital of £150,000 in 1892. By this time the business was mostly concerned with the wholesale trade. A four-storey warehouse was acquired in Leeds with a floor space of 54,000 sq ft.
Brooke Bond had a 1/30th share of the British tea market by 1894. It was claimed that two million Britons drank Brooke Bond every day by 1897. The company had 500 staff and 30,000 sales outlets by 1902. Brooke Bond relocated to Goulston Street in Aldgate, London from 1910. Arthur Brooke retired as company chairman in 1910, and was succeeded by his son, Gerald Brooke (1881 – 1969). Arthur Brooke died in 1918, and left net personalty of £146,003. A large factory at Trafford Park, Manchester, was established to serve the northern market from 1923. Brooke Bond established tea plantations across 1,000 acres at Limuru, Kenya from 1924. Together with James Finlay & Co, the two companies pioneered tea production in East Africa. The mid-market PG Tips brand was introduced from 1930. Brooke Bond acquired the Red Rose tea brand in Canada in 1932. Brooke Bond Dividend Tea was launched in 1935. It was the company’s value product, and each packet offered the chance to win cash prizes. Gerald Brooke retired as chairman in 1952. Under his tenure the company’s tea packet trade had multiplied twenty times. He was succeeded by his son, John Brooke (born 1912), a high-powered, resilient man. Turnover exceeded £68 million in 1954. The majority of sales came from quarter pound packets of tea, of which one thousand million were sold throughout the year. Chimpanzees were first used as actors in television advertisements for PG Tips from 1955. Over 100 million cups of Brooke Bond tea were drunk worldwide every day by 1956, and the company had overtaken Lyons to take the largest share of the British tea market. Brooke Bond was probably the largest tea company in the world by 1957, with a one third share of both the British and Indian tea markets. The company owned thousands of acres of tea plantations, more than any other tea distributor. There were five blending and packing factories in the UK. Company vans made deliveries to over 150,000 shops in Britain. The head office was relocated to Cannon Street, London in 1958. By this time the company had interests in Britain, India, Pakistan, Ceylon, Canada, East Africa and South Africa. Despite its growth in size, Brooke Bond remained highly traditional. Agents regularly attended the tea auctions in Mincing Lane, London, with the time-honoured cries of “I want some” and “am I in it?” But Brooke Bond was also a thoroughly modern company; its annual advertising budget totalled $3 million. Annual sales were $318 million in 1962. Brooke Bond owned 30,000 acres of tea plantations, located across India, Ceylon and Africa, by 1963. The company sold six brands of tea, marketed across 80 countries. 65 million cups of Brooke Bond tea were consumed in India every day. Its Red Rose brand was the market leader in Canada. Brooke Bond employed approximately 50,000 people by 1965. Brooke Bond claimed to be the largest growers, manufacturers and distributors of tea in the world in 1966. Brooke Bond held 36 percent of the British tea market by 1968. Major diversification occurred when Brooke Bond acquired Leibig, who owned the Oxo stock cube and the Fray Bentos canned meat brands, for £36 million in 1968. The merger created the sixth largest food company in Britain, and was to prove a great success. 100 million cups of Brooke Bond tea and coffee were drunk every day in India by 1969. By this time the company employed 12,000 people on its Kenyan tea plantations. Brooke Bond acquired Haywards Pickles, alongside other smaller brands, from the Melbray Group for £1.5 million in cash in 1970. Brooke Bond’s share of the British tea market had grown to 40 percent by 1972. PG Tips was the brand leader in tea with a 20 percent share, while Dividend held 12 percent. 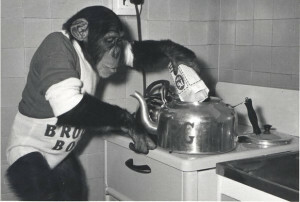 The Times credited the growth of the PG Tips brand to the chimpanzee advertising campaigns. Unilever, the Anglo-Dutch consumer goods giant, acquired Brooke Bond for £389 million in cash in a hostile takeover in 1984. Brooke Bond was the largest tea producer in the world, and held 31 percent of the British tea market. Unilever already owned the Lipton tea business. Haywards Pickles was sold to Hillsdown Holdings in 1989. The Fray Bentos brand was sold to Campbells Soup in 1993. PG Tips continued to use chimpanzees in its advertising until 2002. The Trafford Park factory in Manchester is the third largest tea factory in the world as of 2015. PG Tips remains the highest selling tea in Britain, with a market share of 23 percent. The brand has lost ground in recent times to higher quality rivals Twining and Yorkshire Tea. The Brooke Bond name is no longer in use in Britain. Brooke Bond’s Choicest Blend was latterly produced by Typhoo, but it was discontinued in the 2000s. Brooke Bond remains a major brand in India and Pakistan.